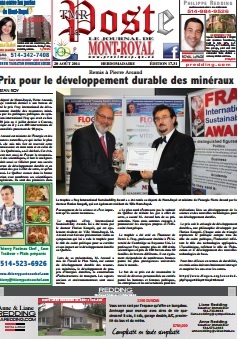 The deputy of Mont-Royal, Pierre Arcand, received last Friday the Fray International Sustainability Award from the 2015 Sustainable Industrial Processing Summit for his public policies related to mineral resources. The summit took place in Cancun, Mexico from June 29th to July 04th, where 400 presentations were given by personalities from 90 different countries. Mr. Arcand is the Minister of Energy and Natural Resources, which includes the Northern Plan. “I am very proud to receive this recognition on my behalf and on behalf of all Quebecers” he declared. “We need to highlight the fact that this event also gives importance to the recognition of the role of scientists. We need to be proud for our successes in terms of sustainable development and greenhouse gas reduction. Quebec progresses in the right direction with its numerous scientists and engineers. They are pioneers of scientific development and it is important that they are recognized”. The trophy of the Fray International Sustainability Award was given to him by Doctor Florian Kongoli, who is also a resident of Town of Mont-Royal. Mr. Arcand had addressed the summit with a video-speech, which earned him the trophy in the category of politics for his career and for his impact on the sustainable development of Quebec. During his presentation, Mr. Arcand highlighted the Northern Plan and focused on the sustainable development of minerals resources, development of the sustainable energy projects and on the construction of transport infrastructure. The social and environmental aspects were also included. "The Northern Plan will not impede Quebec willingness to reduce greenhouse gases, assured Mr. Arcand at his presentation. We are committed to promote clean energy and energy efficiency." The award and its trophy was created in honor of Derek J. Fray, Professor Emeritus at the University of Cambridge, UK. Professor Fray has written over 400 scientific papers and has nearly 180 patents in 60 different patent families. He has also received numerous honors by the most prestigious universities in the world. The purpose of this award is to recognize the work of several personalities or entities among politicians, businesses and academics for achievements related to the development of science and new technologies aiming at sustainable development. The award follows the "sustainable development triangle", a philosophy developed by Florian Kongoli. Each corner of the triangle represents Politics, reflecting the role of political framework; Industry, reflecting the role of applied Industrial technologies; Academia, reflecting the role of education and development of new basic technologies. Dr. Florian Kongoli met Pierre Arcand, Minister of Natural Resources and Northern Plan in his office and had discussion about sustainable development of natural resources, Northern plan and the important role of science and engineering in achieving sustainability.